Strawberries are low in calories and are filled with vitamin C, potassium, folate, fiber, and antioxidants that ward of disease and help our heart. Research suggests eating a serving of eight strawberries a day can help prevent heart disease, manage diabetes, and support brain health. Not bad for something that tastes so great! I had the opportunity to talk to Sue Harrell, Director of Marketing, at the Florida Strawberry Grower’s Association. She a seasoned strawberry grower and the voice of their blog. I asked her about her favorite recipes using strawberries. She described a delicious and simple idea using skewers and layering strawberries, fresh mozzarella, and fresh basil and then drizzling them with a balsamic glaze. She also mentioned a strawberry coleslaw that sounds amazing; it uses ingredients such as strawberries, pecans, and blue cheese with the cabbage! She said one of the best ones was using strawberries in salsa. The sweet-hot combination of strawberries and jalapeno really complement each other. 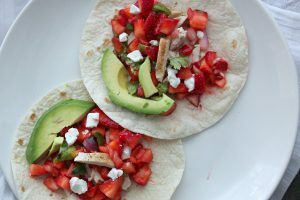 Try out the recipe below for Chicken Fajitas with Strawberry-Jalapeno Salsa by Nichole Crews. This recipe is one of the many featured on their website. I would love to try this one with shrimp also! Find more recipes and information about the amazing benefits of strawberries on the Florida Strawberry website: http://floridastrawberry.org/. To make the strawberry salsa, mix all ingredients well and allow to chill at minimum 1 hour. For the Chicken Fajitas – to a bowl, add chicken, oil, lime juice, cumin, salt and pepper. Mix well to coat chicken. Allow to marinate 30 minutes.